Located on the South Fork of the American River. Reception Center with optional full kitchen facilities, patio area and access to the American River. Indoor and outdoor ceremonies, receptions, banquets. Walking distance to Marshall Gold Discovery Park. Overnight accommodations include cabins, campsites and RV sites. Whitewater rafting trips available on site. 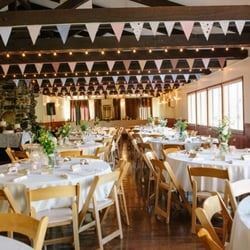 Price is reflective of event space rental only and does not include catering. You are welcome to use your own caterer. Special Features: Kitchen, bathroom, bedroom & living quarters, veranda, queen bed in the bedroom & queen sofa-bed in the living room, two-burner stove top, microwave, coffee pot, toaster, propane BBQ, pots, pans, utensils, dishes, flatware, etc., free WiFi, fire pits. This was one of the most beautiful resorts I have been to in a long time, very clean, on the southfork of the american river, they have river rafting, fishing, all kinds of stuff to do. Manager Chris was a pleasure and very accomodating, we rented 3 cabins on the river, and what beautiful scenery for my friends wedding and reception.